Your ceiling is dirty! damaged or irregular and it needs a hell of a youth? 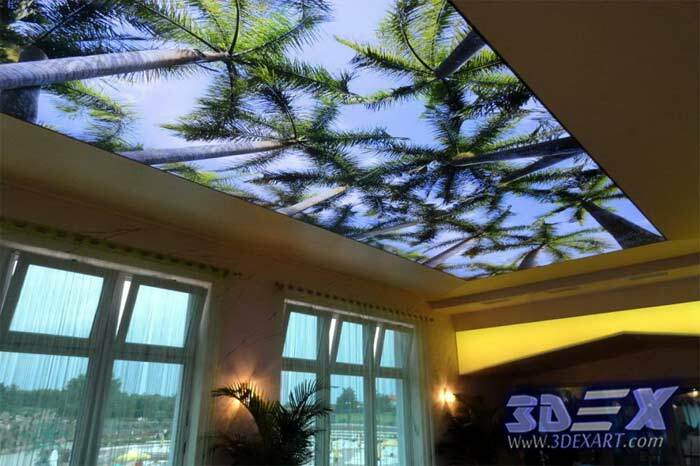 Opt for a 3D stretch ceiling! With a fast installation, it offers a particularly aesthetic rendering and allows you to benefit from very appreciable technical properties. For individuals who want to quickly restore a ceiling, even if it is the kitchen or the bathroom, and want an impeccable rendering or a decorative ceiling. The stretch ceiling is also ideal for companies concerned about the visual quality of their premises, in the hall as in the offices. Recently prescribers (architects and decorators) are fond of stretched ceilings because they become a support for creativity with unlimited perspectives (photos, motifs, typography ...). 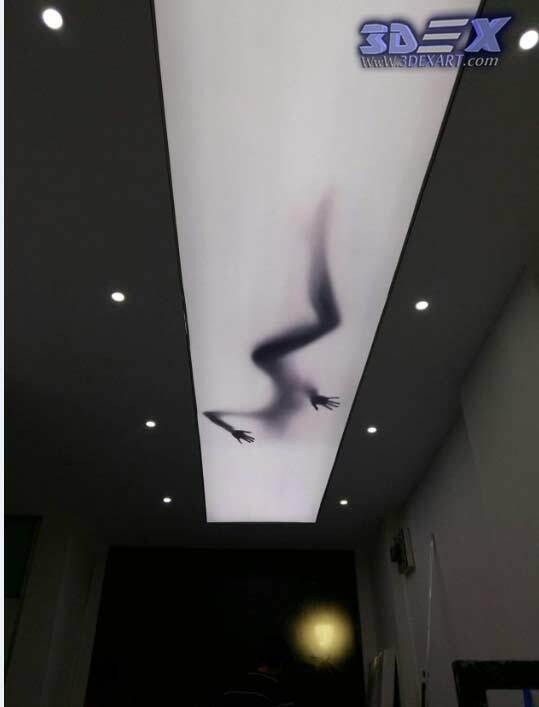 What is the price of a 3D stretch ceiling? How to place a project of ceiling tightening? Who to contact for the installation of a stretch ceiling? explains how to calculate the cost of a stretch ceiling according to your project and presents all the information about the price of a ceiling stretched to the m2. What is a 3D stretch ceiling? A stretched ceiling consists of a canvas stretched from wall to wall. This fabric, made from PVC, is designed to be non-flammable. It is made to measure in the workshop according to the dimensions and the shape of the piece. It is then fixed to "hangers" (specific hanging system) fixed all around the walls. The fabric of the stretch ceiling is equipped with a harpoon line welded on its entire periphery. The installers fix the canvas on installing on the walls of the room. These beams are visible or invisible. Why choose a 3D stretch ceiling? 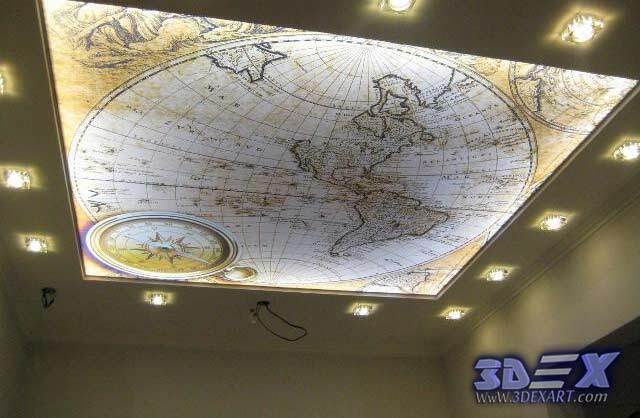 A 3d stretch ceiling makes it possible to create a false ceiling to conceal the defects with a minimum of effort. Acting as a double glazing, it also offers good thermal and acoustic insulation while allowing easy access to technical ducts. A stretch ceiling arises quickly (by professionals). Its implementation does not dirty, is odorless, and avoids having to move all the furniture in the room. A 3D stretch ceiling can also play with colors, finishes ( matt, satin, lacquered, mirror ... ) and can even become a strong element of the decoration of the room since the canvas can be printed. Any lighting system can be incorporated. a stretch ceiling cleans very easily. The most popular today are stretch ceilings because it has a variety of structure and texture. the choice is endless! You can choose not only bright colors of the 3d ceiling canvas, but also classic pastel shades, not so saturated. 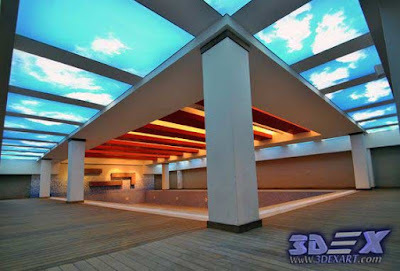 3D Stretch ceilings since their appearance in the construction market were considered an expensive pleasure and not everyone was available at a price. Now, when the range of products presented is so wide that the eyes run up, the cost of such ceilings has fallen so much that it has become accessible to all segments of the population. Moreover, in a situation of severe competition, manufacturers of stretch ceilings are simply forced to lower prices for their products. 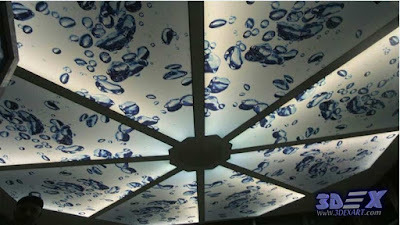 With the help of a 3D stretch, the ceiling can decorate almost any room, both in the apartment and in public institutions. 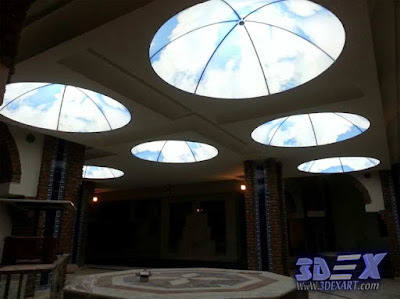 Having conceived a repair in the apartment, you need to choose the right 3D stretch ceiling from all existing types and models. The correctly selected texture of the ceiling can visually change the size of the room - increase it in length or height, reduce or give the room its own, an individual design that emphasizes the character of the owner of the room or its purpose. A combination of a stretch ceiling with a gypsum board ceiling is often used - this method is perfectly suitable for the production of multi-level ceilings. 3D Stretch ceilings are made of several types - stretch glossy, matte ceilings and stretch ceilings with a metallic texture. Tension ceilings made of a vinyl film are produced, which has good elasticity and a large margin of safety. The plastic frame of the 3D ceiling (baguette) serves as the basis for stretching and fixing the blade. Glossy stretch ceiling attracts by the fact that during its operation in the room creates a visual effect of the mirror surface of the ceiling, which visually overstates the height of the room and increases its volume as a whole. The excellent reflectance of the glossy ceiling makes the room much lighter. Matt stretch ceiling is preferable to mount in the bedrooms, as it creates the illusion of some mysterious, intimate atmosphere. Visually, such a ceiling looks normal, unless it has a pattern. The metallic ceiling is considered one of the most expensive materials. For a complete perception of it, additional lighting points are needed. At the points of the most intensive lighting on the ceiling, the effect of changing light and transfusion of the entire color scale is created. To decide which stretch ceiling to choose, there will be only you, but remember a few rules - if the room has a high ceiling, then it is better to install the fixtures on pendants or a form lowered downwards - this technique will allow to slightly reduce the visual height of the ceiling. If your stretch ceiling has a dark color, then you need to use in this room more lights. 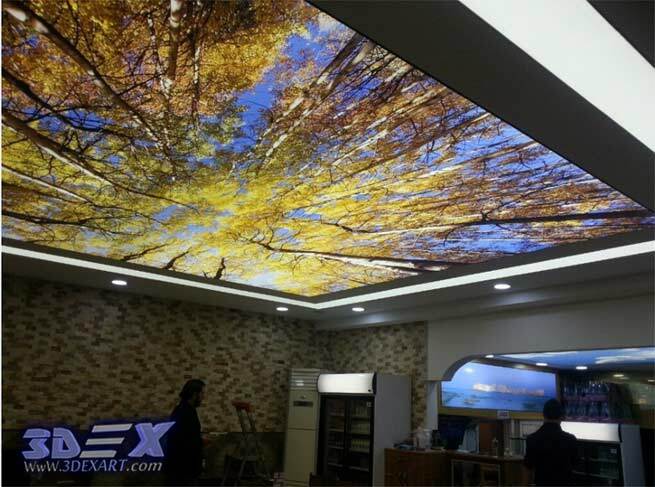 In doing so, try to make sure that the ceiling surface does not strongly reflect the entire luminous flux. For this, you can use side lights with cold light (white, yellow or blue). 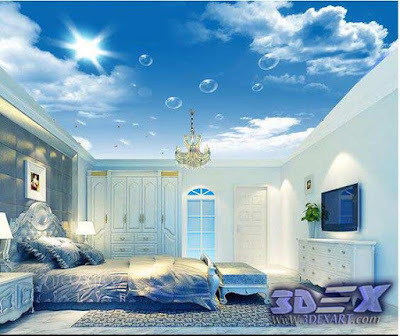 To achieve the maximum 3d visual effect, the ceilings in the rooms should always be slightly lighter than the walls. Use this rule before deciding how to choose a 3D stretch ceiling and how to emphasize its texture and the individuality of the pattern on the surface. 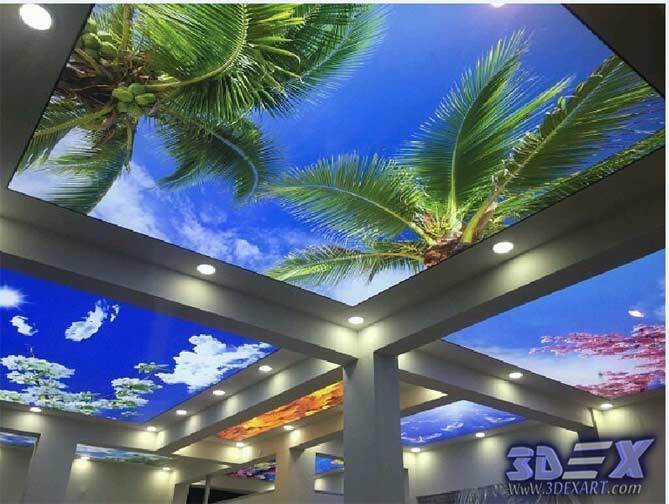 When combining a 3D stretch ceiling with a gypsum board, the lighting effect can be strengthened and the individual details emphasized using LED strips along the perimeter of the ceiling. 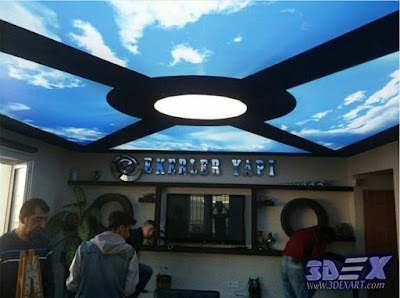 Stretched ceiling with elements of 3d photo printing at the moment is considered the strongest move in the style of premises. 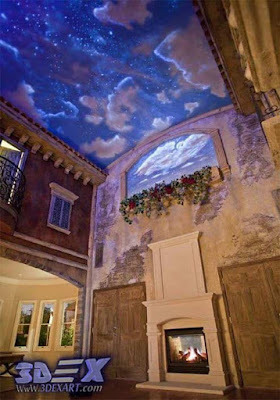 There is also a "starry sky" system, which is built into the 3D stretch ceiling, creating the illusion of the night sky. The indisputable advantage of this coating is its great adaptability. No contra-indications, the stretched ceiling finds its place everywhere, whether in an entrance hall, a corridor, a living room, a bedroom, an office or a bathroom. The plastic material in which it is designed and the way it is installed automatically excludes moisture concerns. But beyond the type of part, the peculiarity of its custom manufacture allows it to take any shape. Thus, it fits perfectly even to surfaces composed of many angles or rounded. The adaptability of the 3D stretch ceiling is, therefore, one of its indisputable assets because it can be posed really anywhere, and even compose with the installation of ceiling lights, chandeliers, and other spots. Indeed, it will not limit your lighting system and will allow you to preserve the one already in place without any worries, technically speaking. On the other hand, as we shall see later, the number of these luminous "obstacles" are all factors rapidly enlarging the note. The range of application of stretch fabrics that have, for example, a glossy surface is very wide. In the living room, you can make a 3d stretch glossy ceiling in almost any color. You can draw a plane in red or in black. Or, for example, combine a red glossy finish with a white matte finish. Black color looks great with white or unsaturated yellow. Again, it all depends on the design of the entire interior, and you can combine any shades. 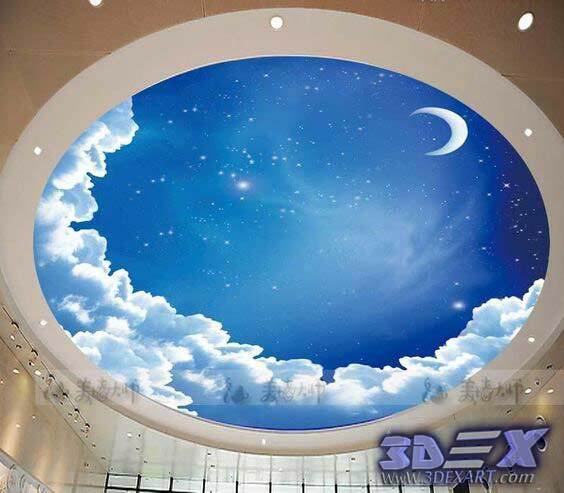 It will also be interesting to look at the 3D ceiling with the imitation of the starry sky, this option is suitable for a children's room or bedroom. Just need to consider that the room for the child should not be too bright, so as not to irritate the eyes. It is better to choose the light, warm colors. 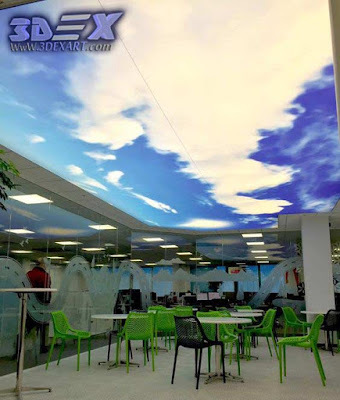 As a rule, in office premises the 3D stretched glossy ceiling is executed in white color. This shade is considered universal. In the kitchen, the ceiling coating can be made of any color, but using a glossy surface in this area will be impractical and irrational. Very often, the stretch structure is mounted in the bathroom. It can be done in any color, but the use of white and light blue shades is considered practical in this area, as they expand the visual space, unlike, for example, green or black, because the bathrooms are not too large rooms like a rule. 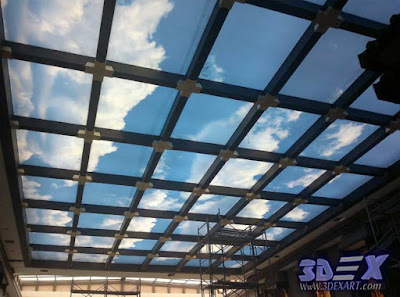 The 3D photo Printing shows examples of a variety of design stretch glossy ceiling. It will be very difficult to carry out its installation by one's own hands since it is necessary to observe a certain technology and use special equipment. How to calculate the price of a 3D stretch ceiling? 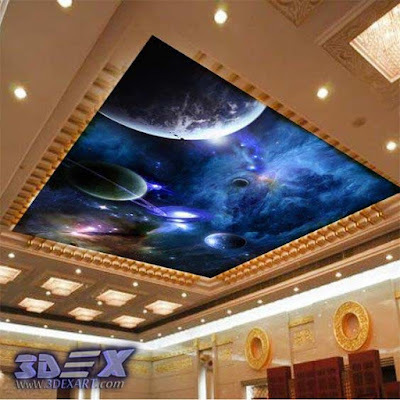 To estimate the price of a 3D stretch ceiling, the price of the materials and the installation must be taken into account. This price will vary according to the configuration of the room especially if the ceiling of this one has a particular shape or if an opening (for a staircase for example) is present. Finally, the important detail, at the price of a 3D stretch ceiling, will be added the cost of accessories and lighting. 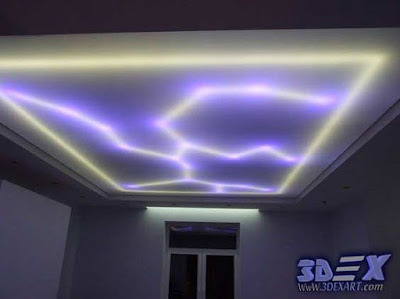 Most of the time you can reinstall your old lighting system without any problems, but if you want to change to something more modern or more suited to the new look of your ceiling, professionals in the stretch ceiling offer accessories and systems modern lighting perfect for this type of ceiling. 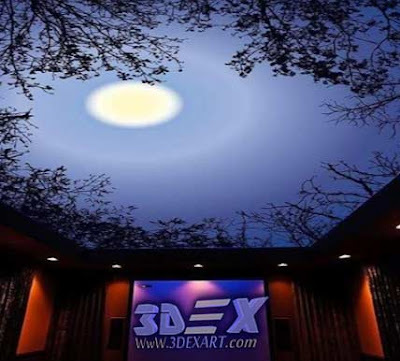 It's up to you to see if you want to review the lighting at the same time as installing your new 3D ceiling. If this is the case you could benefit from attractive prices from your professional for the installation of a lighting system highlighting your new ceiling. The price level, tailor-made requests could also inflate the quote, especially if you want particular reasons. 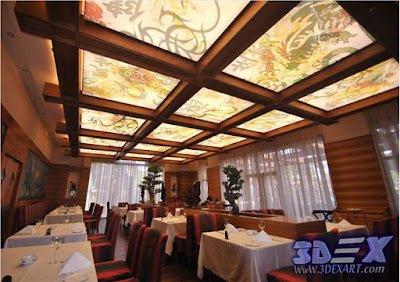 The advantage of the 3D stretch ceiling is that it is easily customizable on request. Do not hesitate to seek advice from your professional. The craftsmen of the 3D stretch ceiling have interesting knowledge and ideas in interior decoration. Ideas that might seduce you. 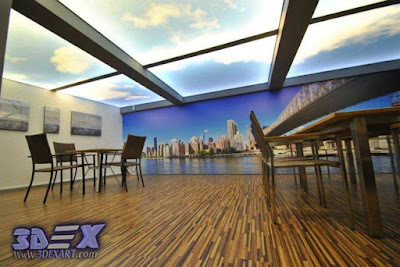 Most professionals of 3D stretch ceiling also propose tariffs decreasing according to the size of the surface concerned. Thus the price of a ceiling tended to m2 will be different according to the size of the ceiling.